including brand new fx routing! For instance, the sound reverser can reverse the input, while simultaneously reversing one of the delay lines. The reverse sound can also be triggered with your keyboard, generating totally new sounds, and sending them into the reverser with its own filter and distortion! You can have 6 delay lines with 8 active multi-mode? filters all operating at once in each of several delay models. Of course, we included basic delay models like a simple mono delay and a stereo delay, but also a tape-sound delay which allows you to change tape length without any clicks. 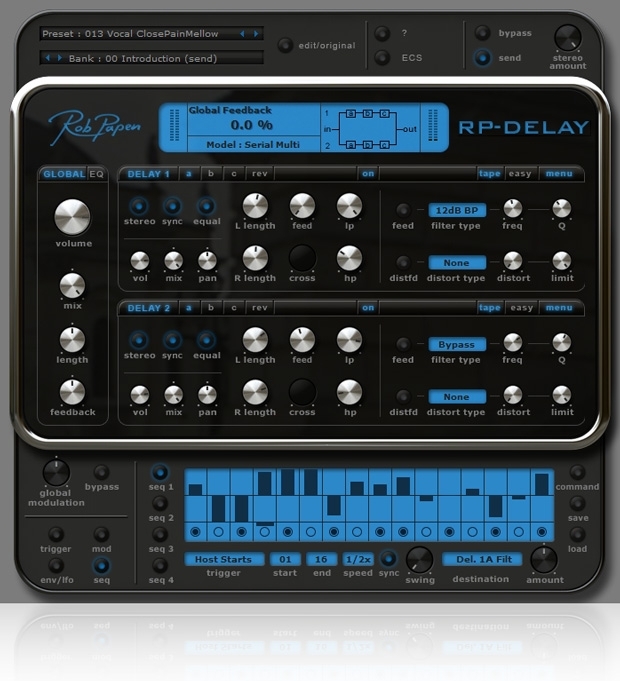 The delays, filters, and reverser can all be modulated by the built-in modulators. There are 4 modulation sequencers, 4 LFO's, and 4 envelopes, complete with several trigger options! 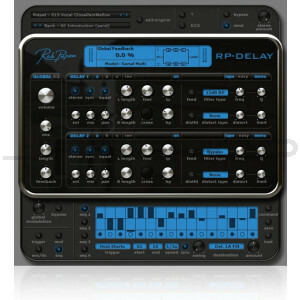 There are many other new features and options for you to discover which aren't mentioned here, so go ahead, take the plunge, and dig into the brand new experience of RP-Delay.